After the hazy, humid days of summer, it’s always nice to greet fall, with its bright, clear blue skies and the beautiful colors of the trees changing for winter. But as anyone who has played a game of golf at High Meadows in October knows, this is also a time of some big temperature changes within the course of a 12-hour day. It’s very typical to start out a golf game at 8:00 in the morning with chilly temps in the 40s, only to be breaking a sweat by the time you get to the back nine, thanks to the sun coming up and warming things up. When you go from 40 degrees to upper 60s in a matter of hours, you need to be prepared to be flexible with your clothing. After all, you want to be warm enough on those first holes that your shivering doesn’t affect your swing, but not unbearably hot when you’re finishing up. This is the material that will be right next to your skin. You’re looking for something that’s moisture wicking and thin so that it doesn’t add bulk or restrict your swing. Look for an athletic shirt in a polyester or merino wool, rather than 100 percent cotton. Cotton tends to feel clammy against your skin once it gets wet with sweat. This is a layer to add warmth, and something that can easily be taken off as you get warmer, eventually leaving you with your base layer only. A sweater or pullover make for a great middle layer, and if the morning is rather mild, it might be these are the only two layers you need. For those days when the early morning temperatures are really cold, or you’re braving the elements like a light rain or some wind, you will want to add a third layer that keeps the weather out. A water-resistant jacket can help you stay dry and also provide a barrier between the wind and your skin. Now is a great time to add to your golf wardrobe, to update your style or prepare for the cooler temperatures. We have a good selection of items in our Pro Shop, including pullovers and jackets from FootJoy. This brand is made especially with golfers in mind, so there’s plenty of flexibility and freedom of movement, allowing your swing to stay in shape even as you add layers of warmth. You’ll also want to be sure to use up any credits you have built up from tournament play. Remember those credits are only good through the end of the year! Come in the shop and see what you might want, or use your credits to do a little early Christmas shopping. We’re always able to do special orders, so if you want something that we don’t have in stock, we’re able to order your size or a different color, and have it here within a few days. 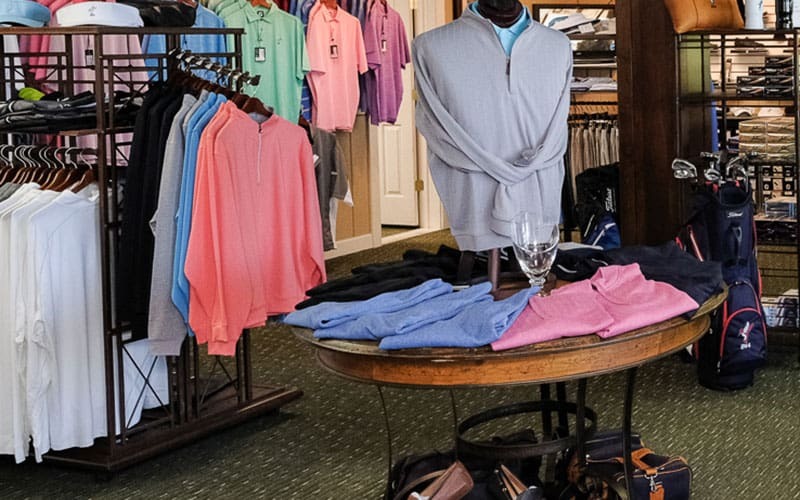 There’s nothing more convenient than getting your golf clothes and accessories right here at the clubhouse.